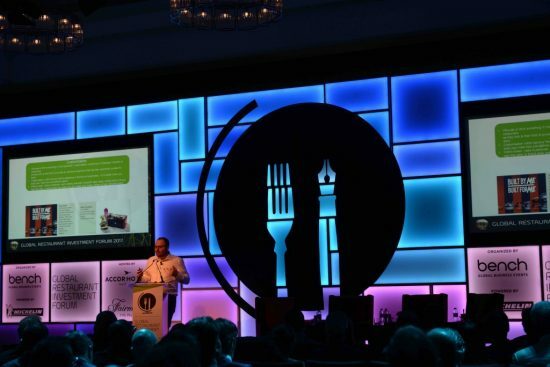 The Global Restaurant Investment Forum 2017 (GRIF), the annual networking and intelligence event for the international restaurant and hospitality community, powered by Michelin, took place at Fairmont, The Palm in Dubai on 10 – 12 April, with over 300 industry professionals in attendance. GRIF 2017’s conference programme provided a macroeconomic overview of the F&B industry and tackled issues such as concept development, finance and lending, investment feasibility, scaling up for sustainable growth, creating a food culture and catering to the digitally-focused customer. A conversation with Chef and Restaurateur Stuart Gillies, Chief Executive Officer, Gordon Ramsay Group. The Culinary Tour on the opening day of the event provided conference delegates with a taste of the latest local restaurant concepts and a chance to hear from the owners on what challenges and opportunities they encountered when setting up the concept. Delegates were treated to lunch at Anatolian concept, Ruya, and enjoyed an opening reception at Lima Dubai on City Walk on Monday 10 April. On Tuesday 11 April, newly opened Folly by Nick & Scott at Madinat Jumeirah welcomed GRIF delegates for a gala networking reception. Delegates enjoying lunch hosted by Anatolian restaurant Rüya, at the start of the culinary tour on the first day of the conference. Conference delegates enjoyed an evening of networking and exciting food on the opening night of GRIF 2017, hosted by Lima Dubai, the authentic Peruvian contemporary restaurant at City Walk, Dubai. Lima Dubai is the first international outlet for Lima, which took London by storm in 2012 and went on to become the first Peruvian restaurant to be awarded a Michelin star, retaining it to this day. An evening networking reception was hosted by newly opened Folly by Nick and Scott on the second day of GRIF. Folly is the new opening from restaurateurs Nick Alvis, Scott Price and Viktorija Paplauskiene, in partnership with Gates Hospitality. Comprised of an indoor dining area and open, interactive kitchen, as well as outdoor bars and terraces, Folly is a concept homegrown in Dubai offering a contemporary menu driven by quality produce and ingredients. Launched in 2014, GRIF is an annual event for the restaurant and hospitality community. It brings together industry leaders and professionals from the hospitality industry, F&B brands, investors, hoteliers, owners, lenders, franchisors, franchisees, suppliers and other key industry professionals from across the Middle East region. GRIF’s features include conferences, roundtable and panel discussions, culinary receptions and other knowledge-sharing platforms together with several senior-level networking opportunities spread over three days. The event is geared towards helping attendees gain valuable insights from industry leaders, build contacts, share best practices with the industry and gain confidence in the market. GRIF 2017 is powered by Michelin and sponsors include: AccorHotels and Fairmont The Palm as Host Sponsor; Dentons, Gates Hospitality, Insignia, Hodema Consulting Services, Lavazza, and Puccini Group as Gold Sponsors; Ento Capital, Ilio Restaurants, LXA, Sealed Air; Soho Hospitality and XN Protel as Silver Sponsors; Folly and LIMA as Reception Sponsors and D.Ream as Culinary Tour Lunch Sponsor.